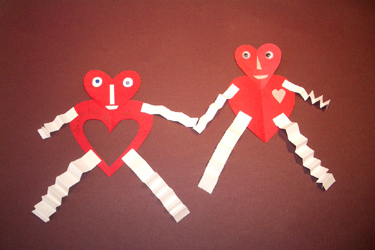 DETAILS To make these Valentine people first cut a large heart for the body, a smaller heart for the head. Glue them together. Cut 2 strips of paper about half an inch wide for the legs. Cut two more strips a little narrower for the arms. Accordion pleat them (a forward and back movement.) and glue them to the body. What the face expresses is up to you. We used wiggy eyes on one, cut outs for the other. Our lonesome man without a heart has a body that is the empty space left by a cut out heart. When you do this, be sure you cut up high enough on your fold so the pieces of the negative space are still joined. Decorate these guys any way you see fit. SKILLS NEEDED Manual dexterity for gluing, and cutting.